In the morning we'll drive to Haridwar (230 kms - 6 to 7 hrs journey). On the way, stop for lunch at a restaurant on the highway. On arrival at Haridwar, check in to your Hotel. In the evening, proceed to Har ki Pauri to enjoy Ganga Aarti on the banks of Ganges. 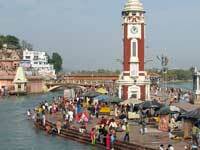 Haridwar is one of the seven holy cities of Hinduism. Legend has it that Vishnu's footprint was found on the bank of the holy river, giving it its sanctity. Situated at the base of the Siwalik Hills, Haridwar is where the River Ganges passes through its last gorge and begins a 2,000km journey across the plains of India to the Bay of Bengal. This morning depart for Rudraprayag, (170 kms - 6 to 7 hrs). On the way, you wiII stop for a brief while at Devprayag, a hill-town perched above the turbulent confluence of the Bhagirathi and Alaknanda rivers where the holy river Ganges comes into being. On arrival at Rudraprayag, check into Hotel Monal Resort. Overnight at Rudraprayag.The small town, Rudraprayag, is situated at the holy confluence of river Alaknanda and river Mandakini. The presence of two separate routes for Badrinath and Kedarnath Dham from Rudraprayag render great importance to the place. 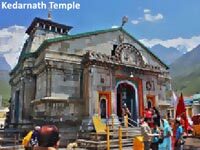 There are more than 200 shrines dedicated to Lord Shiva in the district itself; the most important one being Kedarnath. Early morning check out from the hotel and depart for Gaurikund (76 kms) from where, you will start your 14 kms trek to Kedarnath. You can hire a Doli or a horse, for your trek (Cost Not Included). Gaurikund is a cute little village bustling with activity. You can see mules and horses everywhere used by pilgrims who cannot trek. 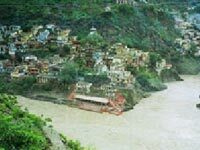 Mandakini, one of the main tributaries of the Ganges originates at Kedarnath and flows through Gaurikund. With rare flowers and streams on the Kedarnath route, you are just walking from one postcard picture to another. Trudging with you are pilgrims chanting "Jai Bholenath." Sometimes the mist would envelop the mountains and slowly lift away, revealing a shiny blinding-white peak that threatens to rupture the skies. The path is almost the real, and unlike many other so-called holy places, one does feel some ancient divinity residing in this frigid dreamscape. Probably there is a reason why they call it the abode of the gods. You'll take a break at Ramabada, which is exactly half way into the trek, for some respite and hot cups of tea. Start again for the final lap towards Kedarnath. The higher you go, the sights that you get to see, are just mind-blowing. The snowy Kedar range grows bigger as you walk towards it. People coming downhill start greeting you with encouraging words like 'U are almost there’... 'keep walking’... etc. Finally you're almost there. Only a few steps to climb. The temple is now in sight. You forget the arduous climb and a feeling of joy overwhelms you.On reaching Kedarnath, you will be checked into your hotel. Those who are energetic enough might want to have darshan of Kedarnath temple in the evening One of the holiest Hindu pilgrim sites dedicated to Lord Shiva, Kedarnath Temple is perched at an altitude of 3,584 meters amidst towering snow-clad Himalayan peaks on the head of river Mandakini. The original temple is said to have been built by the Pandavas to atone for their sins procured during the Kurukshetra war of Mahabharata. 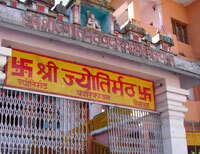 The present temple was reconstructed by Adi Sankaracharya in the 8th century. One of the 12 Shiva-Jyotirlingas resides in this temple. Inside the temple there is an irregular, three-faced linga, representing the hump of Lord Siva when he took the form of a bull. After darshan and puja etc. you come out of the temple and return to the hotel for breakfast. Checking out of the hotel, you'll start the return trek of 14 kms from Kedarnath to Gaurikund by about 8:30 am. On reaching Gaurikund by about 2 pm drive back to Rudraprayag in the vehicles that have been waiting for you. On the way you'll stop at Guptkashi which is an important stop on the traditional pilgrim route. It is set high on a ridge on the west side of the Mandakini river valley. This morning, after an early breakfast, you check out of the hotel at 7.30 am and drive to Badrinath (165 kms - 6 to 7 hrs) via Joshimath. After driving through some wonderful ghat road and probably couple of landslides you arrive at Badrinath by 2:30 pm. Check into the hotel. After some rest and refreshments you're all set to visit Badri Vishal for darshan in the evening after taking bath in the Tapt Kund (Hot Spring). Dedicated to Lord Vishnu, the temple of Shri Badrinathji is 15 meters in height, built in the form of a cone with a small cupola of a gilt bull and spire. Legend dates the temple prior to the Vedic age, though the present temple is believed to have been established by Adi Shankaracharya, the 8th century A.D., and Hindu reformist. 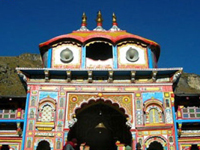 The temple has been renovated several times due to earlier damages by avalanches and looks modern now with a colorful "Singh Dwara" or the main entrance gate. The temple has three parts - Garbha Griha (the sanctum sanctorum), Darshan Mandap (for puja s) and Shobha Mandap (for devotees to assemble). There are 15 idol sin the temple complex. Finely sculpted in black stone, the Badrinath (Vishnu) image is a meter high. Other images include those of Laxmi (Vishnu's consort), Garurh (Vishnu's mount), Shiva, Parvati, Ganesh etc. After darshan, return back to the hotel or visit the town and shop around. Overnight in Badrinath. This morning, after an early morning bath at the 'Tapt Kund' (Hot Spring) and darshan once again, you drive back to Rudraprayag. Early morning, after breakfast, you drive down hiII to Rishikesh, as spiritual city and the Yoga capital of the world. On reaching Rishikesh you'll be transferred to your hotel for overnight stay. In India, certain cities are particularly renowned and revered for the spiritual essence bestowed on them by virtue of being home to one or more of the Hindu Gods and wise sages. Such places often become pilgrim destinations, visited by yogis and seekers who travel from around the world to bathe in their sacred glow. Rishikesh is certainly one such place. In the evening, you'll be taken to Parmarth Niketan Ashram to participate in the Ganga Aarti on the banks of Ganges. Rest of the evening free to experience this fascinating town on your own.